After installing Visual Studio, I install “version control” software – also called “source control”. If you aren’t familiar with version control, it’s something that lets you save a version of the program you’re working on. You save these changes in a “repository”. After you save a version of your program, you can make more changes. If the changes are good, you save the new version. If the changes are bad, you can compare your current version with the last version – to find out where the problem might be. Or, you can “revert”, or “roll back” your changes to the last version. Version control is also very useful if you are working on a project with other programmers. If you become a professional programmer, you’ll almost always use a version control system. If you ever work for a company that doesn’t use version control, I’d be worried – that’s not a good sign. In this video, I show you how to install Subversion – a popular source control system. I’ll install TortoiseSVN, which includes the Subversion server (which lets you have repositories) and a client (which let you save your project to the repository). Then, I show you how to install VisualSVN. This lets you work with Subversion, while you are inside Visual Studio, working on your project. This video only shows the installation of TortoiseSVN and VisualSVN. There is almost nothing in the video on how you can use Subversion while programming. The next video I plan to make is how to install GitHub – an online source control system, for open-source projects (unless you want to pay, and have private repositories). I also plan to make a future video, or videos, on how to use more features of source control. These will cover using automated/unit tests, and using continuous integration to run your tests every time you save changes to your source control repository – letting you know if your changes broke anything. When I installed both, but 2017 version, because I’m using Visual Studio 2017, and import files, I right clicked on the Solution and there was no commit. Then I follow some steps (I’m not sure which exactly) and get account on Microsoft with my FirstProject in it, but all files has blue locks instead of yellow dots. When I played with it a little, I manage to get all yellow dots and also found Commit in right click menu, but when I use Commit, then I got errors -> Unnable to connect to a repository at URL and Unnable to open Repository on local disk (actually shows the path on local disk, which can’t be opened). I tried to uninstall and install VisualSVN again, but it changed nothing. Still have Commit option, but I can’t save Recent Message because of the errors and when I clicked on Team Explorer, this shows me offline. I don’t no what I did wrong and what to do next, I’m completely lost. If you see blue locks, then your solution is using Team Foundation Services (TFS) as the source control provider (https://msdn.microsoft.com/en-us/library/ms245455.aspx). In Visual Studio, try selecting the menu option “Tools” -> “Options…” -> “Source Control” -> “Plug-in Selection”, and selecting “VisualSVN”. You might also need to “unbind” the solution from TFS. I haven’t had a project where I’ve needed to switch from TFS to SVN. So, let me know if that doesn’t work. Yeah, something about plug-in selection pop up when I started Visual Studio. When I chose No (for continue), then I goes offline, when I choose yes, then I got blue locks. Now, I’ve done what you wrote, there was “None” in the Current source control plug-in. I chose VisualSVN, but nothing changed. Still can’t save Commit for the reasons in previous post. Subversion is difficult to debug (especially if I’m not at the computer that is having the errors). But, here are a few ideas. 2. Close Visual Studio. Open File Explorer. Go to the directory with your solution. View Hidden Items. Delete the “.svn” folder. Delete the folder with the existing repository. Open Visual Studio. 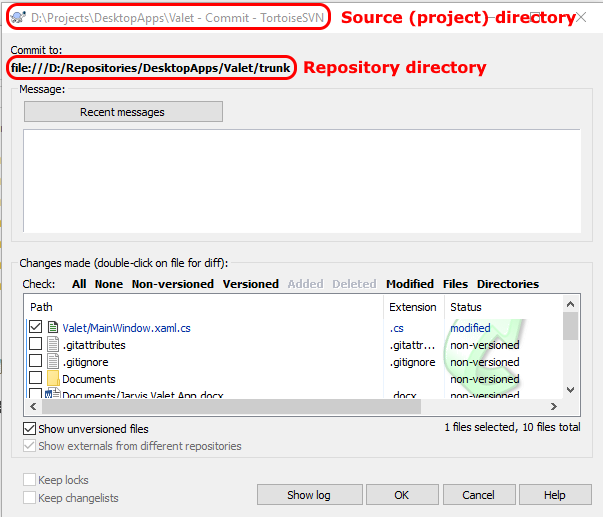 Re-add the solution to SVN source control, but don’t use the “#” in the repository folder name. 3. Use TFS for the source control. It will work the same, and might be good to know if you ever get a programming job for a big company (they sometimes use TFS for their source control). 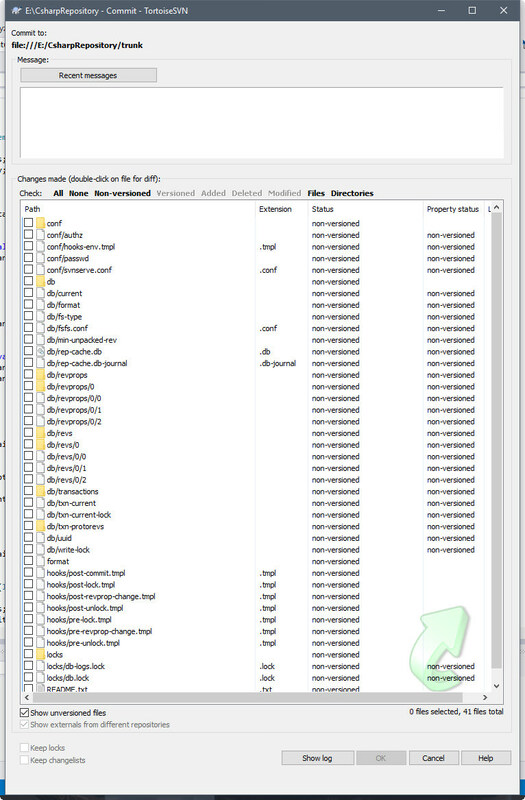 In your screenshot, the files you are trying to commit are in “E:\CsharpRepository” (in the top bar). Your repository in the same location “file:///E:/CsharpRepository/trunk”. You don’t want to create your repository in the same directory as your source files (or in a sub-directory of your source files). It can be done, but it is more confusing to setup. Create your solution in “E:\Projects\MyProject” (for example). Then, create your repository in “E:\Repositories\MyProject”. To commit your project files, you right-click on the folder “E:\Projects\MyProject”, and commit the files from there. I’ve got it and what more, I know exactly where I made mistakes. This last post opened my eyes, because when I did “add to subversion”, the first you must choose, where your project is and I chose folder with Repository (because I don’t read it, I rushed this) and then you must choose location where your Repository would be and then I chose folder with Repository again. I already had project and repository in different directory, but because of that mistake, I try commit project in the same directory as repository and obvious, it’s not going to work. Stupid mistake, but now it’s all working. I will learn from my mistakes and I must really read first and then do the actions. Thanks again for help and sorry for this. Great! Sometimes it helps to have a problem first. Then you gain a more complete idea of how something works.